Petitot and Bossi dedicated this suite to the marquis de Felino, First Minister at the Ducal Court of Parma, where Petitot served as Court Architect. Among the 30 designs included are the vases Petitot developed to adorn the court gardens along with other more fantastic creations that were probably never realised but ensured the success of the suite which was re-issued and copied numerous times. Today the suite is famous among print and ornament specialists both for the singularly atypical approach it takes to a stock ornamental motif and for the beauty of Bossi's refined etching tehnique. The first issue of the suite was entitled 'Suite de Vases' and comprised 34 plates: 30 etched plates of designs along with two engraved dedication plates, an etched pictorial title-plate and an etched pictorial dedication. The title plate is dated 1764 but the last few plates in the sequence are dated 1765 indicating the entire suite was not published until then. The suite is frequently cited in the literature as both the 'Suite de Vases' and the 'Suite des Vases'. This confusion stems from the addition of an engraved title-plate to a later re-issue in which the suite was entitled the 'Suite des Vases'. 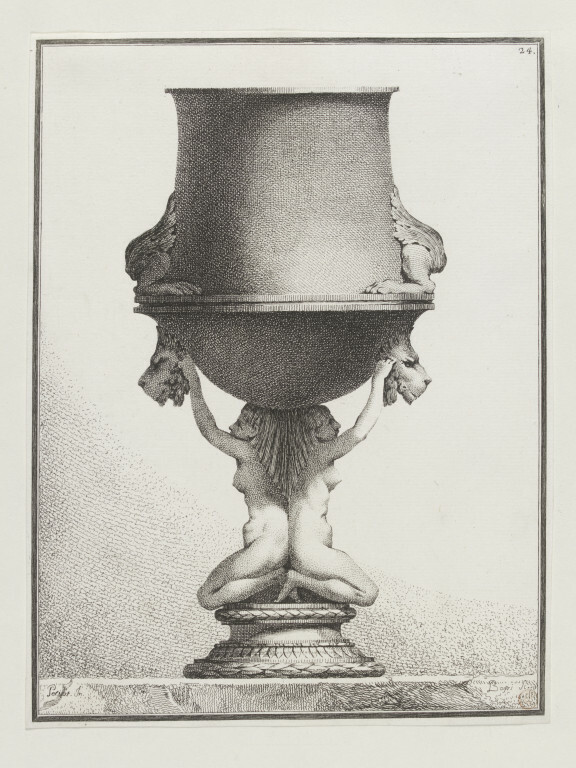 Ennemond-Alexandre Petitot (after), plate from the 'Suite de Vases' a series of 30 designs for vases etched by Bossi after Petitot. 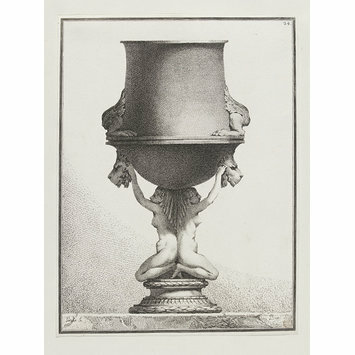 Italian, etching, first published 1764-5. Guilmard, D., Les Maîtres Ornemanistes, Paris, 1880-1881, p. 225, 27 (2). Cole, W., 'The States of Petitot and Bossi's Suite de Vases', Print Quarterly, Vol. X, No. 2, June 1993:156-159. Petitot was a pioneer of the neo-classical style. This strong clear design should be compared with the rococo vase by Rudolph nearby.